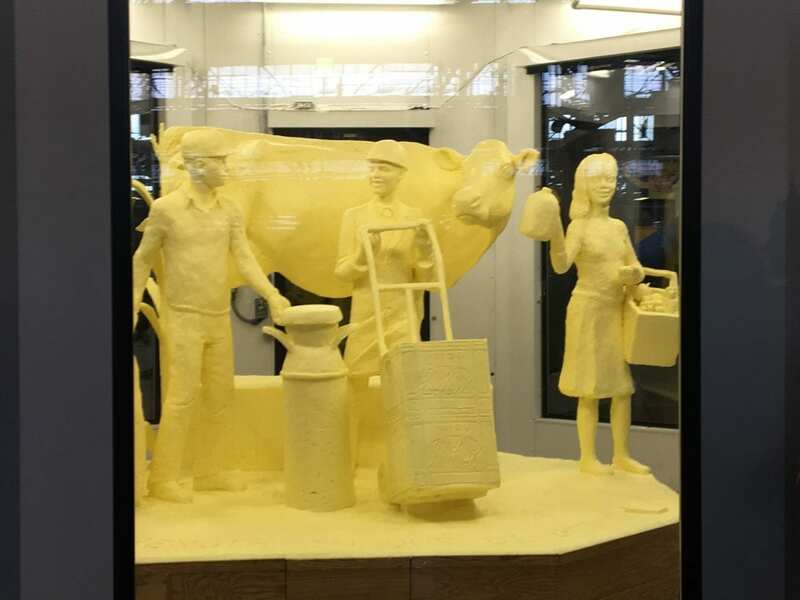 HARRISBURG (WSKG) — The Pennsylvania Farm Show opens this weekend and after months of planning, its centerpiece has been revealed — a sculpture made from 1,200 pounds of butter. Like every year, dairy farmers, state officials, and dairy princess pageant winners stood shoulder-to-shoulder in the cavernous Farm Show complex in Harrisburg as it was unveiled. Agriculture Secretary Russell Redding said people often have a very specific image in mind when they think of Pennsylvania agriculture—say, a rural farm in the midstate. But he said this is meant to show that the industry’s impact is much bigger. Husband and wife team Marie Pelton and Jim Victor, of suburban Philadelphia, have been making the Farm Show sculptures for years. But they said this one is the biggest they’ve ever done. They worked on it for two weeks straight. Why was there more work? Pelton and Victor said they’re relieved to be finished, but can’t rest too long. Their next work—a chocolate sculpture for Hershey Chocolate World —is due in a few weeks. The butter sculpture is available for viewing at the Farm Show in Harrisburg, which runs from Friday, January 5, to Sunday. After it’s over, the 1,200 mass of butter will shipped to a nearby dairy farm, where it’s turned to methane gas that’s used for energy.